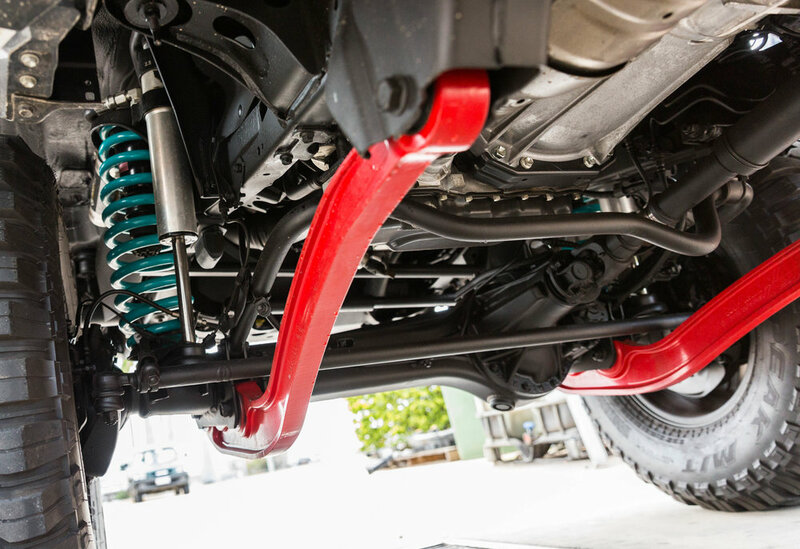 AEV is an authorised installer of JMACX Offroad Solutions products in North Queensland. We can tailor a package to suit your needs. This is the flag ship of the the JMACX product line. This is a drive in/drive out solution that includes everything required to make your vehicle road legal. Additional services are also available including full suspension kit, long range tanks, wheel and tyre packages, winches, bullbars and more. If your wagon requires, we can also arrange the dual cab conversion. Give us a call to discuss what you require. This product is currently offered in Toyota Landcruiser 79 Series and 200 Series. 2017 VDJ79 with 4" coils and shocks with cradle powder coated RED. This product is a full replacement for the rear suspension on a VDJ78 or VDJ79. It includes a new rear diff housing that track corrects the rear tyres to the front, chromoly axles, new rear exhaust, and swaybar. The diff housing is strengthened and allows a GVM of up to 3.9 or 4.2 tonne. Factory diff centre is maintained. Coil and shock options are nearly limited to options available under the Federal Approval (Kings/Ironman or Icon). The cradle that includes the new shock towers can be custom powder coated to a variety of colours. If it's a GVM upgrade you want without the coil conversion, this is the option you need. It includes a new upgraded diff housing as above. It also includes new chromoly axles and retains your factory diff centre. This option also track corrects your rear tyres to your front tyres. This option can also raise your GVM up to 3.9 tonne. These are replacement radius arms for VDJ78 and VDJ79. They can be used on 2" lifts and are required for 4" lifts. Stronger than factory radius arms, they are available in pre-2016 VDJ's and also now available for 2017 VDJ's. (New Land Cruisers have different shaped radius arms). They can be custom powder coated to a variety of colours. We can supply and install a number of items to upgrade the stopping power of your vehicle. These include Braided Brake Hoses and Upgraded Brake Boosters. Brake boosters are available for VDJ78/9 in ABS and non-ABS.